Situation: You are an Orthodox Jew. You have been dancing the Hora for hours and are downright beat, schvitzing like crazy. The problem is that you are across town, excessively famished and ate your last gefilte fish hours ago. You aren’t sure if the local haunts are kosher or not, but you could really go for a burger. What is a kashrut-keeping Jew on the go supposed to do? If you recently spent $1500 on a set of Google glasses and downloaded the latest in technology, it is simple. You just fire up the JewGlass app, and surf your way to a list of Rabbi-approved dining options in the vicinity, reviewing the menu as you walk over. 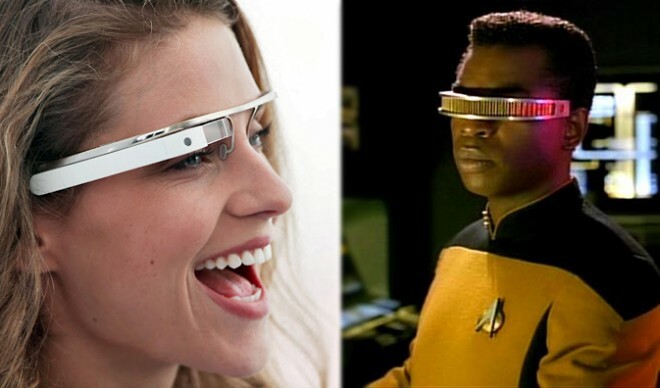 Google Glass comes in two styles. Yes, it is true, the latest in Hebrew tech is now available and promises to solve this and many other common problems encountered by the modern day Orthodox. I find this incredibly interesting, but it begs several questions. First, if this gets popular will it not TOTALLY annoy every orthodox Jew who did things the “Old fashioned way”? I mean memorizing from the Torah is a drag for any 12-year old studying for his Bar Mitzvah. But it just got decidedly easier for the millennial sand-bagger generation. I gotta think that this will create some uber-peeved old-schoolers. I could see “studying for my Bar Mitzvah with a real Torah” becoming the new “walked to school uphill both ways in the snow”. Who can blame them for the angst? Were I Jewish, I’d resent any Jewwy-come-lately who didn’t have to rock an actual Torah on their Mitzvah. Just saying, dude it’s the Mitzvah. The second thought I immediately had was what about JC and his crew? What are the implications of Google Glass for Evangelicals? I feel like we need an app of our own. That begs the question, if we had one, what would it do? Instant Yelp ratings for home-schooling co-ops? •	Will Google Glass make a big splash when released this winter? •	Would you buy a pair? •	What functionality are Evangelicals in need of? In this case the technology advances are great for religion. No more kosher mistakes, the Torah is always at your fingertips, and unique social networks can help find those to which one may be equally yoked. Certainly there is concern that the depth of ones faith may be shallow if everything is at our fingertips and we no longer feel compelled to memorize passages from the Good Book. I would argue a much bigger concern is advances in biotechnology and where that is heading (e.g., cloning, genetic engineering, stem cell research). What is important is that we ask how these advances help to build our relationship with God and determine if they glorify Him (and not us).